A simple message can go a long way. 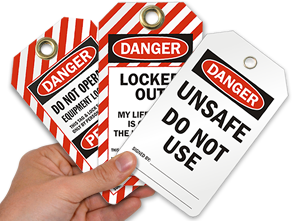 This tough Lockout Safety Tag can go the distance - great for marking your inoperable equipment. 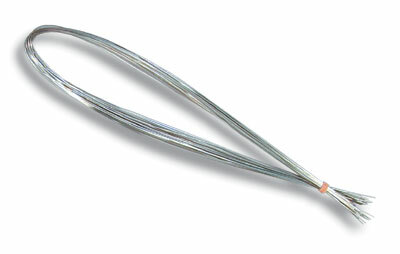 • Brass-reinforced eyelets allow for a firm hold on this double-sided tag. 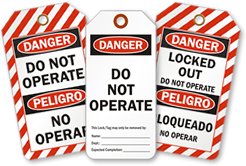 • This 'Do Not Operate' set includes 25 tags and 25 heavy-duty nylon ties for a complete tag set. Self-Laminating Danger Tag - 2 Thumbs Up! These are well made, high quality tags. The flaps work well to protect the 'writing' on the tag. I use a UV Resistant marker to help what was written on the tag last longer. The nylon tie wraps come in a separate bag that keeps them together. Will do the job required!